When working all day, sitting can become tedious and make individuals less healthy. 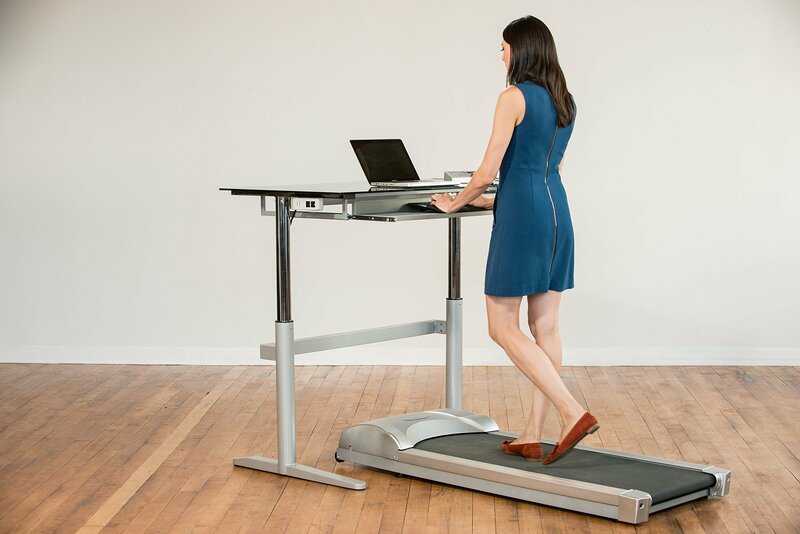 As an alternative to sitting at a desk, productive individuals can use the Rebel Treadmill 1000 to get work done at a desk while walking. This can work to improve focus, burn calories, and help busy professionals to get a workout without wasting valuable time. Unlike other treadmills, this one is built strictly for walking. When trying to get work done, the Rebel Treadmill’s maximum speed of 2 miles-per-hour is more than sufficient. Quite simply, running while attempting to type is an impossible proposition due to the logistics of the activity. Below is a full explanation of the advantages and disadvantages of using the Rebel Treadmill 1000. Intuitive Interface – The simple interface on the treadmill displays important information such as speed, running time, and total distance. Simple Design – When trying to work, advanced settings can undermine productivity. With the Rebel Treadmill 1000, everything is designed in a way that minimizes interaction and allows for maximum productivity. Durable – The treadmill comes with a strong frame and is built of metal and solid-rubber materials. 20-Year Warranty – The manufacturer is so confident in the product that they have insured the frame for a full 20 years. Other components such as the motor are warranted for 2 years, which is quite impressive. Looks Good – This treadmill is designed to look great in any office to impress clients, colleges, and friends alike. Sitting for more than 6 hours per day can create distractions and cause poor health. Many professionals who sit all day will find themselves taking unnecessary breaks by getting an unnecessary snack just to take a walk. In addition to less healthy eating, this can encourage individuals to waste precious time away from productive activities. With the Rebel Treadmill 1000, these problems are eliminated and a healthier lifestyle can be enjoyed by users. This treadmill is designed to help professional office workers keep their focus in addition to staying healthy. Walking on the treadmill increases the heart rate and therefore encourages greater concentration. This means that productivity can actually increase when using the treadmill. Of course, productivity will also improve as less unnecessary breaks will be required throughout the workday caused by a sedentary working environment. Instead, individuals can be more active, happier, and actually more productive. The Rebel Treadmill 1000 has also been given a great design in addition to its actual functionality. From the time the device is initially delivered, it comes in great packaging and is designed to impress. The plastic exterior body is appealing and gives the treadmill a solid look and feel. Below the exterior body, the treadmill has a robust metal frame and high-quality parts. While the treadmill only goes up to 2 miles per hour, the motor does this effortlessly without sounding like it is struggling. This is nice when on the phone, since clients and others won’t have to hear the treadmill working in the background. The treadmill itself is more than 5 feet long (64 inches) and two feet wide (24 inches). The actual running surface measures 49.6 X 18.1 inches, which is more than comfortable when going for a focused walk. Instead of colliding with the frame and other components, users can reliably stay on the running surface even while concentrating on work. This is a nice feature over some of the other treadmills available in the market, which generally have a small running surface that requires full concentration on running. The warranty is yet another feature that shouldn’t be overlooked when evaluating this treadmill. A 20 year warranty on the frame is more than sufficient to cover what is essentially a lifetime warranty. With a 2 year warranty on the motor and other components, buyers can depend on being able to use their treadmills for a long period of time. For some users, 2 miles per hour might not be fast enough. While this is certainly enough for most who are walking while trying to get work done, this isn’t a multipurpose treadmill. Users will have to buy a second treadmill if they actually want to do any serious aerobic exercises. Of course, this brings into question the realism of using a treadmill for sweaty exercises in an office. Most business owners and professionals don’t want to work in the same environment where workouts take place. While the simplicity of the treadmill might be preferable for some, those looking to change advanced settings are out-of-luck with this device. Many users might appreciate the simplicity, but the technophile that likes to tweak everything might not like the simple controller. Instead of advanced settings, this treadmill has just simple functionality like increasing speed and simple output. More advanced control features like desktop integration are not available for this treadmill. However, this actually helps to keep focus and make the treadmill easier to use. This simplicity is a trade-off, and should be considered by prospective buyers before moving forward. The Rebel Treadmill 1000 is a versatile treadmill that is just right for use while working in an office. 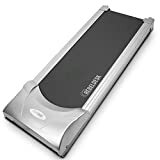 For uses outside this application, the treadmill might inappropriate and prospective buyers should consider getting a standard treadmill instead. With simple controls, the device minimizes the amount of distractions that it could potentially generate due to its presence. Overall, the device seems to be a good choice for use in the office. From a wide running surface to the warranty, this treadmill presents a good opportunity as a long-term investment. For those looking for a healthy alternative to sitting all day, the Rebel Treadmill 1000 might be right for many office workers today.